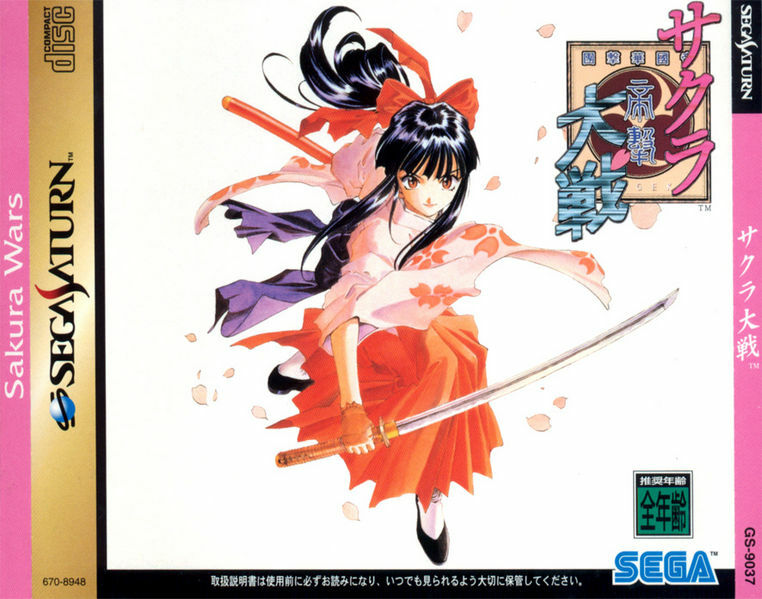 In the mid-nineties the rise of 3D gaming left many of SEGA’s older franchises behind. While most were either abandoned or received largely forgotten two dimensional entries, some were completely reinvented for the third dimension. Though it doesn’t bear the After Burner name, Sky Target was in fact the first 3D entry in SEGA’s After Burner franchise. Released in 1995, the arcade version of Sky Target never achieved its predecessor’s success, failing to even leave Japan. Western gamers wouldn’t get to play Sky Target until SEGA ported the game to the Saturn in 1997, where it would be quickly forgotten. 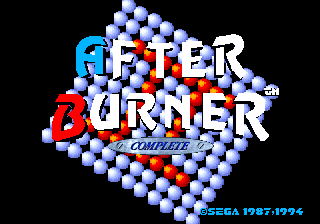 At first glance, After Burner looks like the perfect candidate for a transition to the third dimension. After all, the game is already trying to simulate 3D play. In reality, Sky Target’s design decisions actually perfectly illustrate why so many SEGA franchises struggled (or failed) to make the 3D jump to begin with. Sky Target would introduce many drastic changes to the After Burner formula, many of which would find their way into 2006’s After Burner Climax. Do these design decisions work, though? Does Sky Target live up to the reputation built by its predecessor? 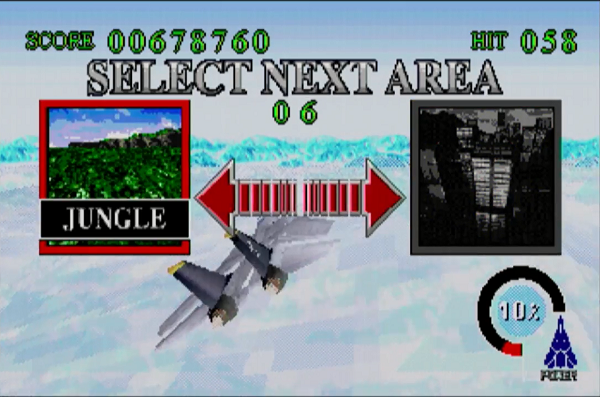 Sky Target is the first genuine rail shooter in the After Burner franchise, featuring game play more akin to Star Fox and Panzer Dragoon than its predecessors. Rather than flying around in a boundless scrolling field with no set landmarks, Sky Target restricts players to a set path, walling off their movement at the edge of the screen. Sky Target also lacks the speed of its ancestor, featuring a more sluggish plane that can’t barrel roll, can’t fire missiles as frequently and takes up a larger portion of the screen (though the view can be adjusted). The plane also now has unlimited missiles and a health bar, giving players a much larger margin for error and allowing them to mash the rocket button as much as they want. 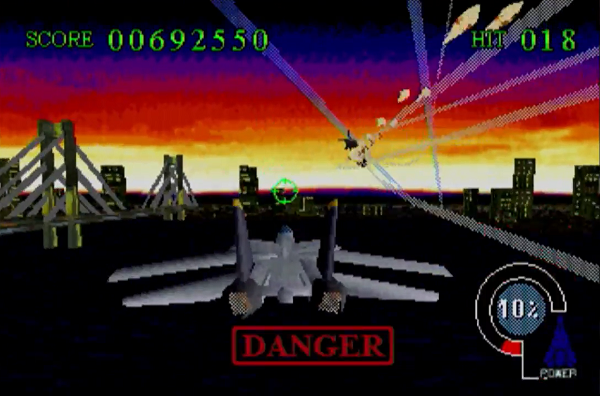 Sky Target is an easier, slower game, unable to produce the same amount of adrenaline that After Burner could. Sky Target’s design decisions actually perfectly illustrate why so many SEGA franchises struggled (or failed) to make the 3D jump to begin with. 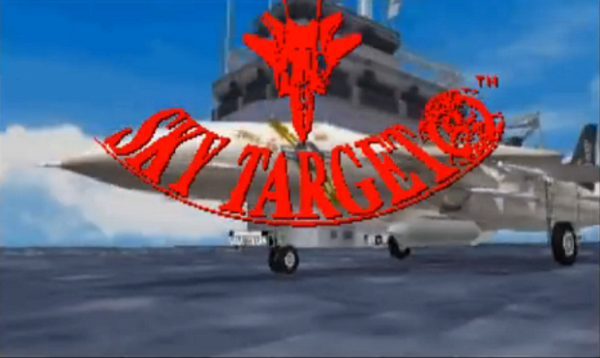 Despite all these changes that should be damning to a game like After Burner, as a rail shooter…Sky Target works. It doesn’t pack quite the same thrills that made its ancestors popular, but the game brings a few of its own to the table that help it stand on its own. 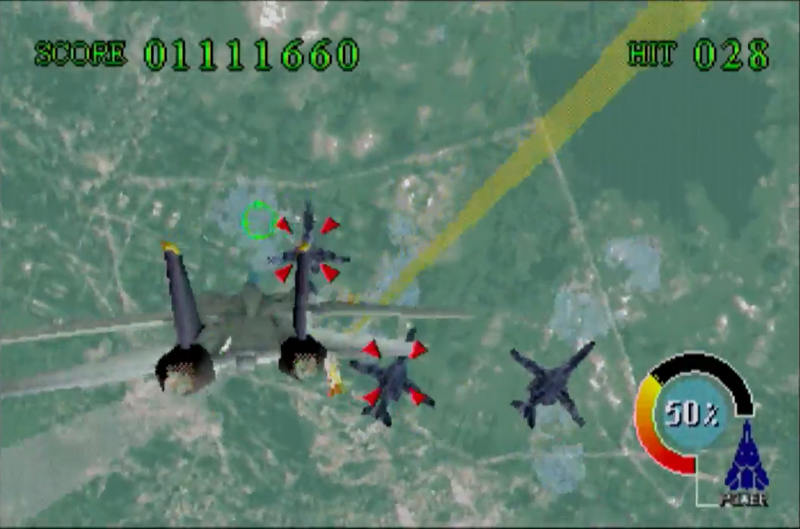 Sky Target introduces massive, screen filling bosses to the After Burner formula, including a gigantic impractical stealth bomber, an oversized helicopter and an ICBM with mounted turrets. In place of the endless scrolling fields of forests, towns and swamps of the original are a variety of distinct environments including a city filled with skyscrapers and a large suspension bridge, a desert filled with Egyptian ruins and a military base reminiscent of the Death Star trench. Sky Target also brings a wider variety of enemies to the table that behave in different ways, including helicopters that hover in place, large bombers, blackbirds, and trains. What Sky Target lacks in speed it makes up for in variety. Sky Target also introduces a new branching mission structure and additional planes. Though the only difference between the planes appear to be cosmetic, the branching mission structure adds a decent amount of replay value to what is otherwise a fairly short game. 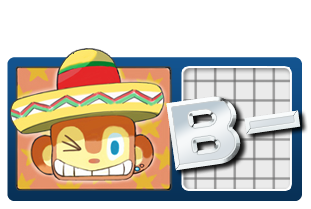 Most of the game is divided into two distinct paths that only share a single stage and a few bosses between them, so the game needs to be beaten four times to see everything. 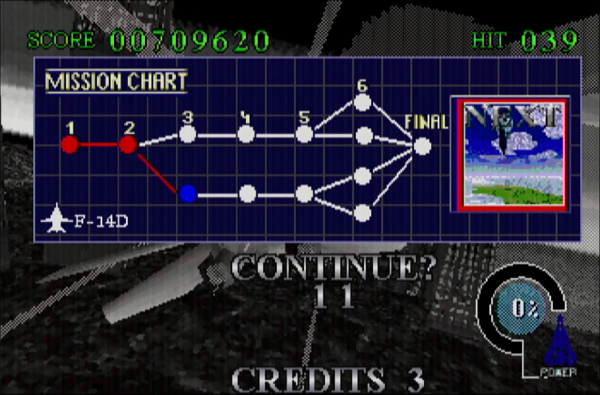 If branching paths aren’t enough, the game also has a ranking mode. This is where a lot of the meat is for console gamers: you’re tasked with playing through missions from the game individually and increasing your rank. You increase your rank by earning stars in individual missions. The stars are in turn earned by doing well in a given mission by achieving high grades in weapon accuracy, damage, boss clear time and other categories. Earning fifty-eight stars unlocks the ultimate prize: the super-fast, powerful White Sword fighter jet. Provided you’re interested in improving your performance in the game’s twelve levels, you will be spending more than one afternoon with this game. Finally, the Saturn version of the game is also compatible with several different controllers. In addition to the Saturn’s standard digital pad, the game also works with both the 3D Control Pad and the Mission Stick. Sky Target is a game that requires some nuanced control and comfortable trigger buttons, so be sure to invest in at least a 3D pad for this game. As of this review I’ve yet to play this game with the mission stick, though I will be sure to update this review when I eventually do. This game was clearly rushed to completion, as the graphics lack the polish of other Saturn games from SEGA. Though the game runs well enough during the less intensive parts of the game, the frame rate can get pretty crazy during some of the more populated levels. Pop-in also tends to happen a lot, not only in the more intensive levels but also during some of the bosses and in other places where pop-in really shouldn’t be happening. The bosses easily suffer the most from the downgrade from the Model 2 arcade board to the Saturn hardware. Aside from the aforementioned pop-in, many of the designs have devolved into a mess of shapes and polygons. One boss is so deformed it can be difficult to tell what it’s even supposed to be. The Saturn’s 3D hardware is well known for being difficult to work with and this game does look better than many third party efforts I’ve seen. As a SEGA port though, it’s a little disappointing. 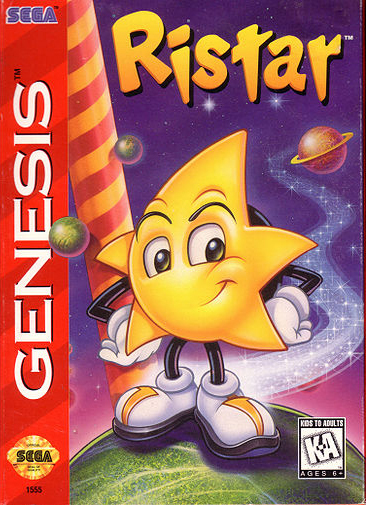 This game was clearly rushed to completion, as the graphics lack the polish of other Saturn games from SEGA. As is typical for a SEGA arcade game, Sky Target’s soundtrack is solid. Its music isn’t quite as good as what you might find in other games of the era, like Daytona USA and Virtua Fighter, but its got a nice metal vibe to it that allows it to stand out from some of the other arcade soundtracks I’m familiar with. That said, the best track in the game is easily Nanae Kenda’s new After Burner arrangement, and nothing else in the game even touches After Burner’s music. 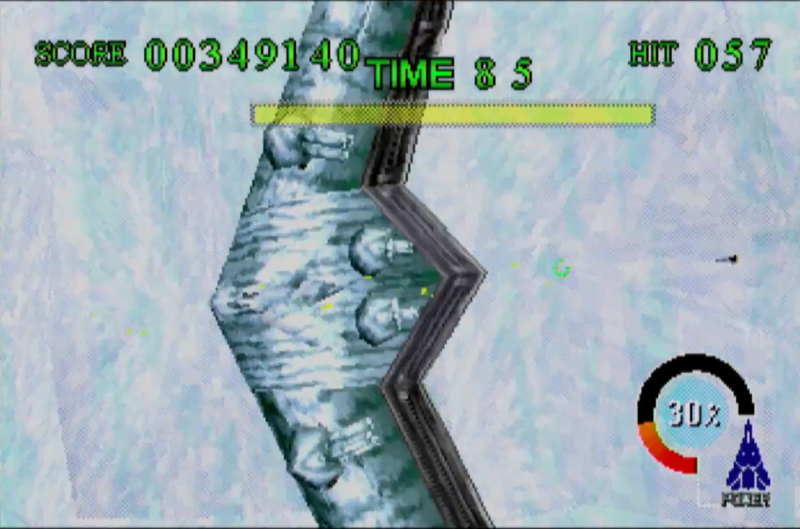 Compared to SEGA’s best Saturn games, Sky Target feels like a junior effort. As a rail shooter it doesn’t touch SEGA’s Panzer Dragoon series and it sacrifices too much of what made After Burner great to live up to its legacy. Even so, Sky Target is a really fun game, worth owning if you’re a fan of rail shooters or if you love the After Burner franchise. 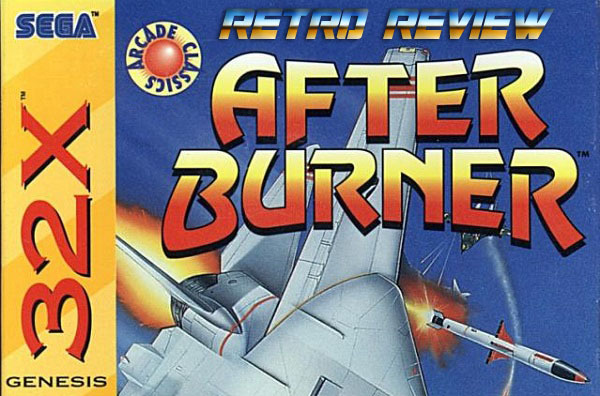 In addition to being fun in its own right, Sky Target represents After Burner’s first awkward step into 3D gaming which would later be more successfully realized in After Burner Climax, which utilized many ideas first explored by Sky Target. So if you’ve got a few bucks, a dusty Saturn and an afternoon to kill, go ahead and pick up Sky Target. It’s a solid effort and one well worth checking out if rail shooters tickle your fancy. I enjoyed playing this on saturn. I don’t see it as a afterburner successor, I see it as its own game. I used to play this during the Saturn years. I found a used copy in a clearance bin of a video rental store. It was fun and definitely felt like a 3D Afterburner in spirit. But, just not as memorable. It just got clustered into the early 3D limitations, almost like it was made just because polygons were the rage. I think the review is spot on though. Not too great, but good enough to give it a go and have some arcade fun.